"When I was 6 years old, I lost my left arm in an accident. My disability became an opportunity instead of a deterrent due to the support and encouragement of my family. My father enrolled me in school even though at the time, women in my region were not usually allowed to complete their education. I am proud to have been in the first batch of Aga Khan Higher Secondary School, Hunza. While working for the Aga Khan Foundation, I was selected for a DFID and Aga Khan funded scholarship to the UK. I completed my Masters at the University of East Anglia Norwich and am grateful for the education I received. Studying in the UK was beyond what I had imagined. The unique teaching style motivated me to learn on my own. Instead of trying to get the best grades, I focused on learning and understanding things. During that year, I consulted so many books and libraries because I had the urge to learn more. The university exposed me to new experiences and gave me the confidence to voice my concerns when I felt something was wrong. I got a chance to put this in action after I returned to Pakistan and started working. 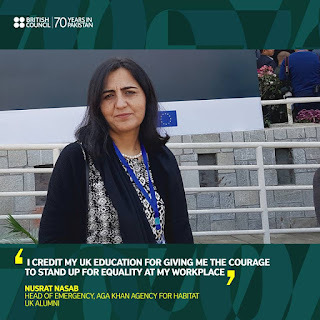 When I was passed over for a promotion and a male colleague was selected to head my department, I realised that the organisation did not have a selection criteria and simply had a bias against women. I told the senior management that the promotion should have gone through a proper recruitment process. They re-advertised the position and I was successful in getting promoted. I credit my UK education for giving me the courage to stand up for equality at my workplace. In the UK, I never felt different. People were sensitive towards my disability and I never experienced discrimination because of it. Many of my friends couldn’t complete their education because they got married. I feel very fortunate that despite all the challenges, I have found success and now I have an opportunity and responsibility to help people in need."